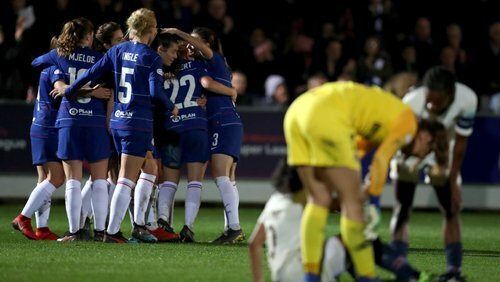 Goals from Hannah Blundell and Erin Cuthbert sealed a 2-0 Women's Champions League quarter-final first-leg victory over Paris St Germain to give Chelsea a significant advantage to take to France next week. The right-back's second goal of the competition this season lit up a relatively uneventful game at Kingsmeadow in the 73rd minute and Scotland international Cuthbert, who will be suspended for the second leg after a late booking, scored a crucial second two minutes from time. There was little between the sides in a cagey first half in which the physical approach of PSG, finalists in 2015 and 2017, succeeded in negating the hosts. For Chelsea, without the suspended Millie Bright, Erin Cuthbert was denied by an Irene Paredes sliding block after seizing on a defensive error, while the visitors' Ashley Lawrence fired wide just before the break. Fran Kirby, the competition's second-highest scorer this season with five in four games, was sent on seven minutes into the second half and her introduction proved instrumental. She almost broke the deadlock immediately when she was slipped in by Beth England but dragged a shot just wide. Goalkeeper Ann-Katrin Berger pushed away a Lawrence shot destined for the top corner before Blundell struck 17 minutes before the end. After some good build-up play involving Kirby Blundell looped a shot with her weaker left foot over PSG goalkeeper Christiane Endler. The hosts, bidding to reach back-to-back semi-finals, were denied when Sophie Ingle hit a post at a corner and Maren Mjelde's follow-up was blocked, but there was still time left for Cuthbert to convert Kirby's pass.